Extreme Promotions and Races will be hosting an AMA Extreme Dirt Track National Race round 5 of 8 at Busco Beach in Goldsboro NC. 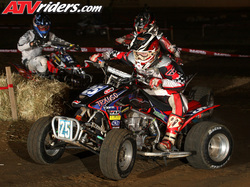 Round 2 of 6 in the South East Extreme UTV Side-By-Side Series will be in the schedule as well. Professional nationally ranked competitors will come from all over the country to battle for the 2013 championship title. This race is jam packed with adrenaline pumping action that is sure to stimulate all spectators and racers.